A blog devoted to tropical plants from around the world, especially the edible ones! 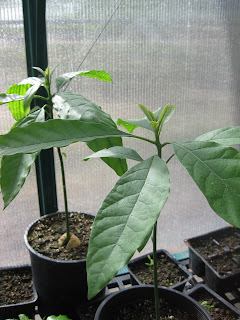 The avocado (Persea americana) is one of the more popularly cultivated tropical plants. A common name for this fruit is the Alligator Pear, named in part to its rough skin and pear shape. Its native to the Americas and has a wide variety of culinary uses especially in dips and sandwiches. The trees do best outside (in tropical/sub-tropical climates) where they will grow tall and fruit abundantly. The best areas for the cultivation of avocados are zones 9-11+. If you can protect your avocado from frost then growing in a lower zone may be possible. The best places to grow Avocado in the United States are California, Florida, and the lower states. If you are buying a live avocado tree, be sure to check it's hardiness; be certain that you can provide a warm enough environment for it. For those of you living in colder climates you can still grow avocados inside your house or in a greenhouse, although in these situations it will be unlikely that you get any fruit. 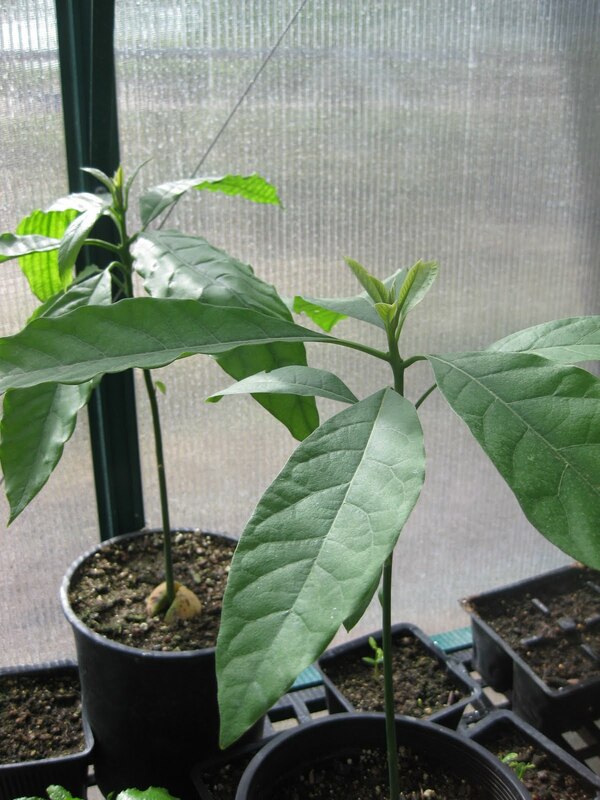 When young the plant looks like a typical house plant, similar to a money tree (Pachira aquatica). Next time you are making guacamole think twice about throwing away the pits. Have some fun with them, try growing them in water. This method is easy, fun, and rewarding, if you have a little patience. You will need three toothpicks, a small cup, and an avocado pit. First place your seed(s) in a glass of hot water (120-130F) to kill any possible avocado root rot pathogens. Place your avocado pit pointy side up and gently push in the toothpicks equidistant from each other just less than an inch from the tip. Now make sure you can suspend your pit on the rim of the cup. Fill the cup with water and put it just about anywhere that won't get too cold. Change the water often (1-2 times a week) to keep the necessary oxygen levels so that the roots can breathe and to prevent stagnation. Time for germination is anywhere from 3-6 weeks (or more) so this is where a good patience is needed. I have noticed that the warmer it is the faster they germinate so try to maintain a temperature range of 60-85F. I have had a 100% germination rate with my avocado seeds so they seem to be one of the more viable kinds of seeds out there. To improve chances of germination further be sure to plant soon after eating the fruit. 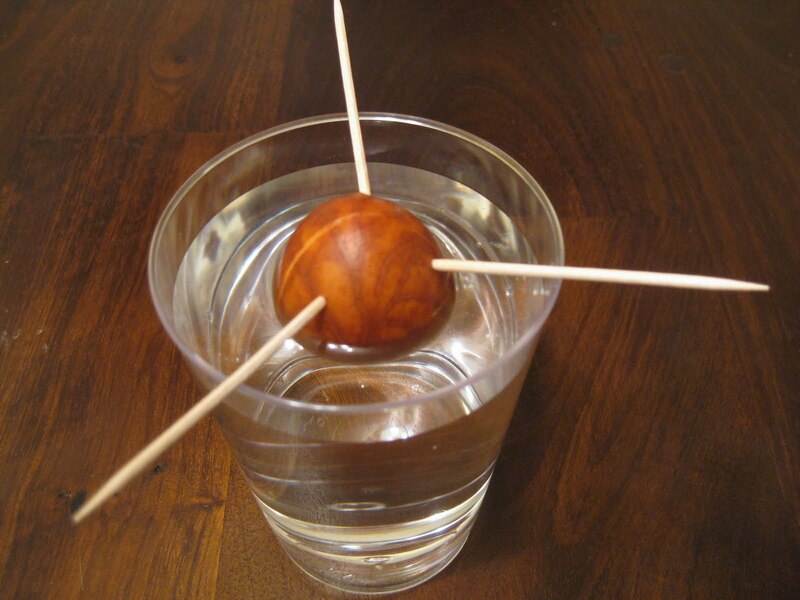 If you are serious about growing an avocado tree, plant your sprouted pit in a moist and well draining soil. You can skip the toothpick method and just plant the seed directly in soil which works great too, just isn't as fun. They do the best in somewhat sandy soils but most generic potting soils work well too. Make sure the soil and container have adequate drainage, poor drainage is lethal for avocados. The soil's Ph should be around 6 but don't worry too much about the Ph. Growing store bought avocado seeds doesn't always produce a true to type plant. This means that if you eat and plant a Hass avocado seed the result could be a tree that produces no flowers/fruit or bears fruits with a poor flavor, unlike that of the fruit which the seed came from. If you are worried about this being the case, don't hesitate from growing those avocado pits anyways, you can still use them as rootstocks. This means that you cut off the entire plant at the stem/trunk and graft on a branch from a productive avocado. Being so, the grafted growth will contain the exact same DNA as the parent of the graft resulting in a clone of the parent tree. Each avocado variety has it's pros and cons so do some research. Some can take the cold a little better while some produce bigger fruit or different colored fruits. Some of the most popular varieties of commercially grown avocados are Hass, Reed, and Bacon. For serious avocado growers, you can mix and match rootstocks and grafts. For instance some people pick out a variety of avocado that does great in their soil conditions or is especially disease resistant for the rootstock and then find a heavy producing plant to graft onto the rootstock. This results in a specialized avocado tree that suits the growers' soil conditions and climate while producing the kinds of fruits that they love. These two avocados were grown using the toothpick method. Every day I would check on them to see if anything new happened, but every day they were still just avocado pits in water. Just as I was about to throw them away I noticed that a thick taproot was coming out of both seeds. Growth was still slow though, I blame the cold winter months. I started them just about 6 months ago and they are already over a foot tall! All of the avocado seeds I have planted since have come along a lot faster, or so it seems. These avocados are taller than the ones I grew outside, this is because they received less light next to a window compared to outside in direct sun, and naturally grew up towards the sun. For these taller avocados (and all young trees for that matter) you should gently shake or tap the stem. This acts as an artificial wind. With this movement the plant releases chemicals that signal for the plant to reinforce its stem. Be sure that the soil is very well draining, soggy soils are deadly. Keep on the lookout for avocado diseases, these can strike at a moment's notice. Protect from severe heat by planting in partial shade or under a larger tree. Protect from cold temperatures (Keep in mind an Avocado's hardiness varies by variety). It may take up to 10 years or more before an avocado will bear fruit, so be patient. Fertilize younger plants (Over one year old) with a high phosphorous fertilizer, while mature fruiting/flowering avocados should be given a high nitrogen fertilizer. 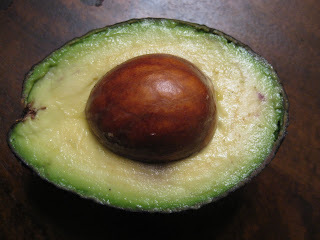 Use fertilizer sparingly, avocados are sensitive to over fertilization. I have sprouted several in water and my sprout at the top always turns brown just as it leaves the pit then after a good few weeks decides to branch off and grow several shoots, anyway idea why this is...? I have encountered this quite often myself, branching of avocado stems at the pit can be due to two phenomena. It most likely branched during very early stages of embryo development within the cotyledon. This produces many shoots that come out of the pit. It is also possible that your avocado is polyembryonic and in fact two distinct plants (like fraternal twins). I would leave the stems be, extra shoots may die in the future, or you may end up with an avocado bush! Where do you buy avocados other than Hass? This is an excellent article. i loved it! 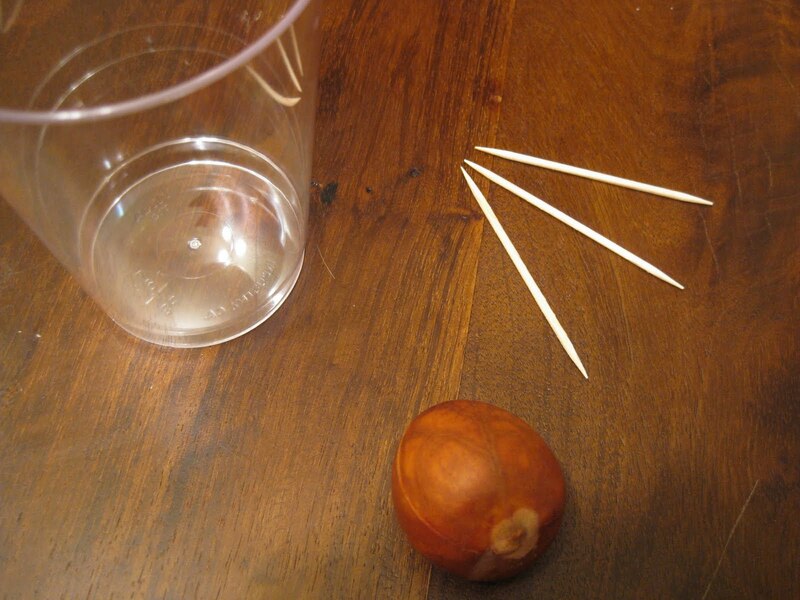 Can I use tiny metal nails instead of toothpicks? Would it kill the seed? That should probably work. Let us know if that works for you!